For the third and final (?) iteration of my “Tactics For Dummies” diatribe, we will look at combining all of the individual and Buddy Team tactics into Fireteam tactics, in order to maximize your little group of autists. Fireteam tactics fall under the umbrella of battle drills. A battle drill can range from reacting to an IED to breaching and clearing a trench system. Chances are, however, you wont ever see a trench system in your life that will merit that, so we will focus on the most barebones and essential drills to go over as a Team. You may not like it, but this is what peak Fireteam performance looks like. Buddy Teams will continue to fire until it becomes permissible to move, in which case they will move to the nearest covered position. From cover, they will continue to engage. The Team leader will make the choice to either retreat or assault through, based on how he analyzes the situation and the odds of victory. If he decides to BREAK CONTACT, he will call this out. Based off of the terrain, he will decide where there is a proper avenue to retreat. He will call out for the Buddy Team furthest from the opposing force to lay down a suppressive base of fire. At this point, the Team leader can decide to pop smoke to occlude vision of the enemy (this is if he even has smoke). Buddy Team not firing will peel backwards along the egress avenue. Buddy Teams will bound away until not engaged anymore. Follow Steps 1 to 4 outlined above. Team Leader decides to ATTACK. He will tell this to the rest of the Team, and base his decision off of 3-to-1 rule and force multipliers. Buddy Team closest to the enemy begins to lay down semi accurate fire on the enemy. The farther Buddy Team breaks off, moves to the flank of the enemy along the most hidden and covered position. Team Leader moves with the maneuver Buddy Team, decides on a good position on the flank of the enemy. Team Leader has maneuver team get on line, they begin advancing. Concurrently, the team leader will call out to the suppression team to shift their fire away from the maneuver team. Maneuver Team assaults through the enemy, ventilates enemy, kicks weapons away, pushes through. Suppression Team ceases firing as Maneuver Team assaults through, once Maneuver Team clears a predesignated point, Suppression Team will pick up and assault through same area at a perpendicular angle. Teams reach their designated limits of advance, cross-load ammo and water, treat casualties, and gather intel from dead enemy and the site. That’s basically it on the attack. It can be scaled up to squad or platoon, but more often than not you either won’t have those numbers, or you have enough experience to transcend this series. Some international flair done by a Fireteam (360° security). In the event you have weapon systems that are not just janky milsurp rifles, and have some crew served weapon systems in burst or full auto, the Fireteam becomes a much more formidable group. For example, the M249 Squad Automatic Weapon is integrated into US Army Infantry Fireteams as a tremendous force multiplier for the Team Leader. The SAW is the most casualty producing weapon on the Team, and therefore during movement and assaults the Team Leader should take the automatic rifleman with him, allowing the Team Leader to personally emplace him. Other roles in the Team that the Team Leader should keep close are : Grenadiers, Marksmen, Radio Operator, and medic. All those roles are integral to the machinations of the Fireteam, however the organic US Army Fireteam usually only has the auto rifleman and the Grenadier to his disposal. Note: don’t try to bunch up like this as a Fireteam. I’m sure the Marines had their reasons, which are probably better than yours. While the auto rifleman might be the most casualty producing member, the Grenadier can be argued as the most flexible of the Fireteam. 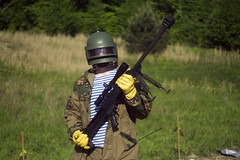 With the right logistics, the Grenadier can have a grenade for almost any situation, be it an HE grenade for anti personnel and light vehicles, a smoke grenade to occlude enemy vision, a flare to signal to friendly forces there something is, and “shotgun” (never used by the way) grenades for up close anti personnel use. The Grenadier can be used for indirect fire offense, as an aid for the maneuver element, or to signal to hard hitters in fixed and rotary wing so your autists don’t become extra crispy. All in all, the Fireteam will be the largest element you will be able to field with little to no experience. Done correctly, it will be the perfect compromise between maneuverability and firepower, and can achieve good effect on targets with the right experience and equipment. Compiling tactics from all three parts of this series, you should be able to dominate your local airsoft field (cause lets face it, that is all you will use this for in the end). All of the info above was either taught to me or sourced from a few books. These books include: The Ranger Handbook (2011 Edition) and the Combat Leader’s Field Guide (10th Edition).